I am on the final hours of my glorious spring break this evening. I felt as though I did a nice job of balancing relaxing, working, and entertaining this year. Often times, I have a to do list as long as my leg which usually ends in disappointment. This year, I had one task that for the sake of my heart and soul I had to finish. It is a project that has been going on since winter break. You know how that goes right? But I got that huge, big, magnificent task checked off our to do list. 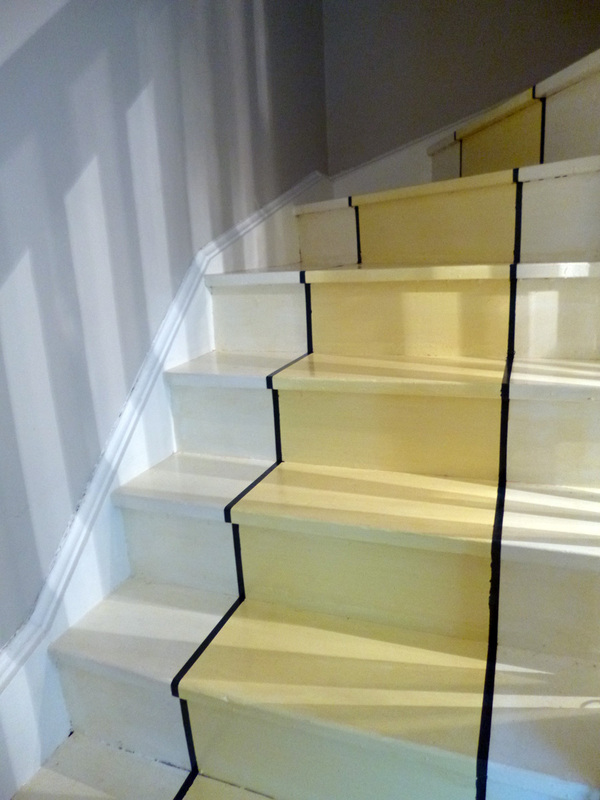 Our staircase runner and pinstripes have been painted. CHECK! For to see the full transformation one must go back to the beginning. Of course, I only have this picture. Lucky for you it has Max in it (hot!). See the stairs to the right. 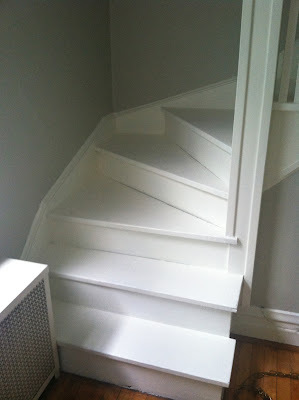 The stairs were built to have carpet on them, that is for sure. There were some pretty largish gaps between the boards and a couple of those gaps were 'filled' with duct tape. Brilliance! I 'fixed' that by filling the gap with a epoxy/sawdust combo and then a bit of sanding. It looked pretty gnarly until it was painted. Picture? You would like to see a picture? Sorry. I'm an amateur blogger. I forgot. Anyway, that stuff isn't exciting anyway. 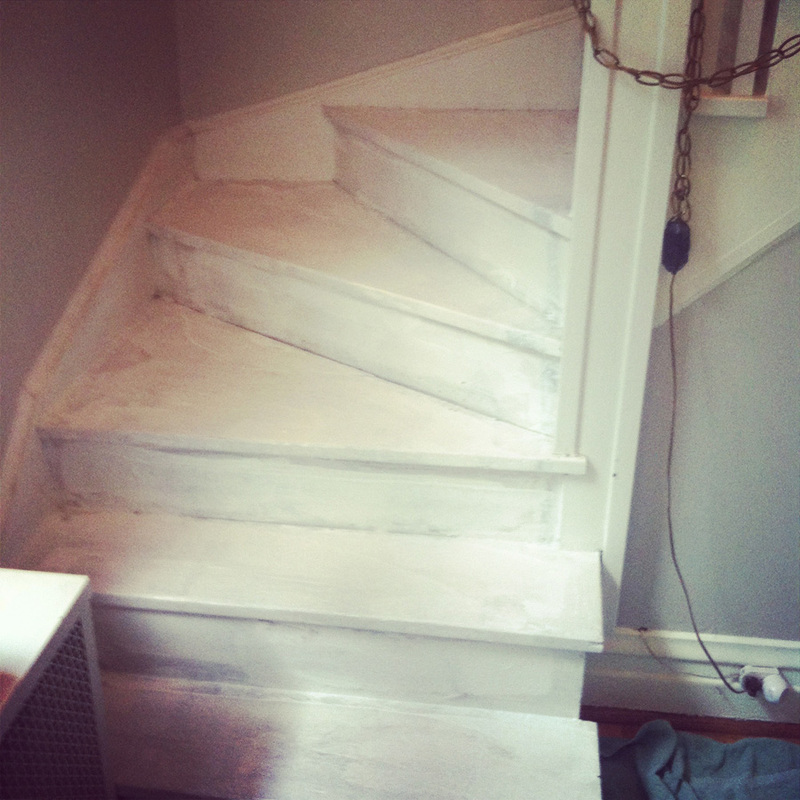 So way back in December I primed the stairs. About two months later (yes, I realize the significant time gap). I painted the outer trim white, or if you wanna be high brow about it - Fragrant Jasmine. Then I had to call in the reinforcements. I know myself, and I know that precision is not my specialty. I had to call upon the careful expertise of Max to measure and tape the runner. It took him all afternoon, poor guy. But, damn, does it look good. I painted the runner while Max was away at work and he came home to another taping job. This time the pinstripes on either side. We left the existing tape on and added another strip 1/2" from the inside. 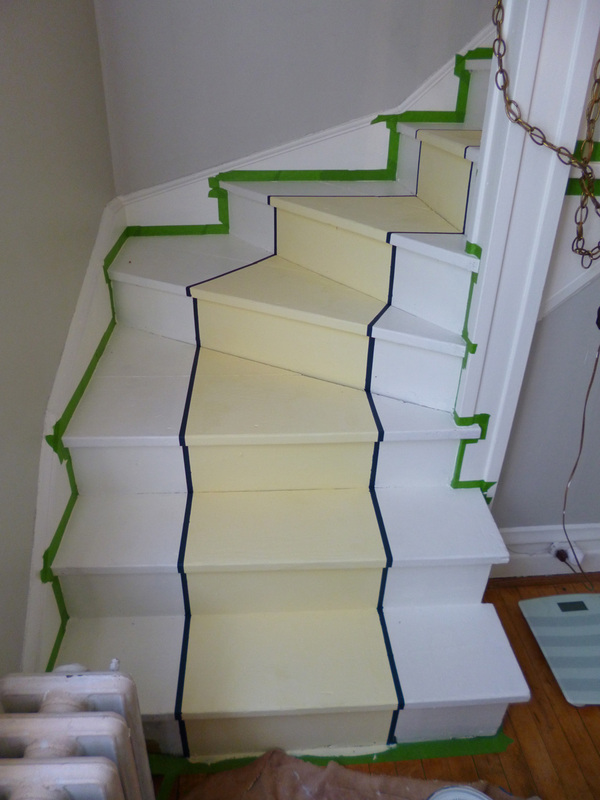 I was nervous about painting the pinstripes. 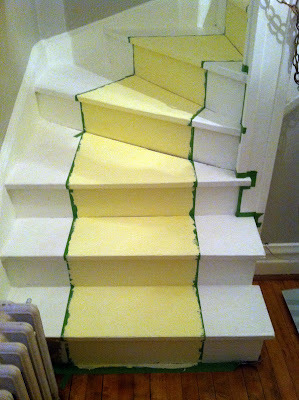 I thought for sure the paint would bleed through, but I didn't have much trouble. There was one spot I had to clean up which just took a little doing. Tada! Look at those stripes! 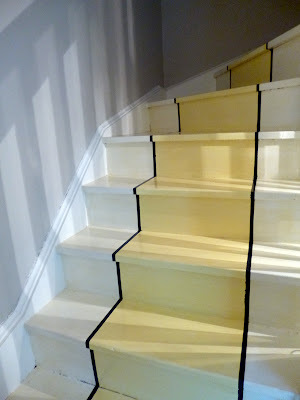 We have such purpose and direction now when we go up and down the stairs. Like royalty or something. 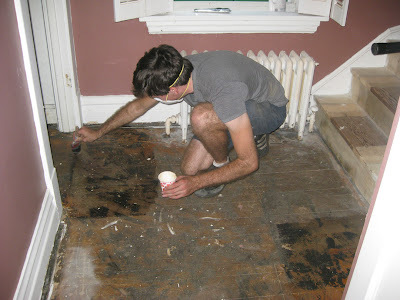 The final and probably most important step was the polyurethane. 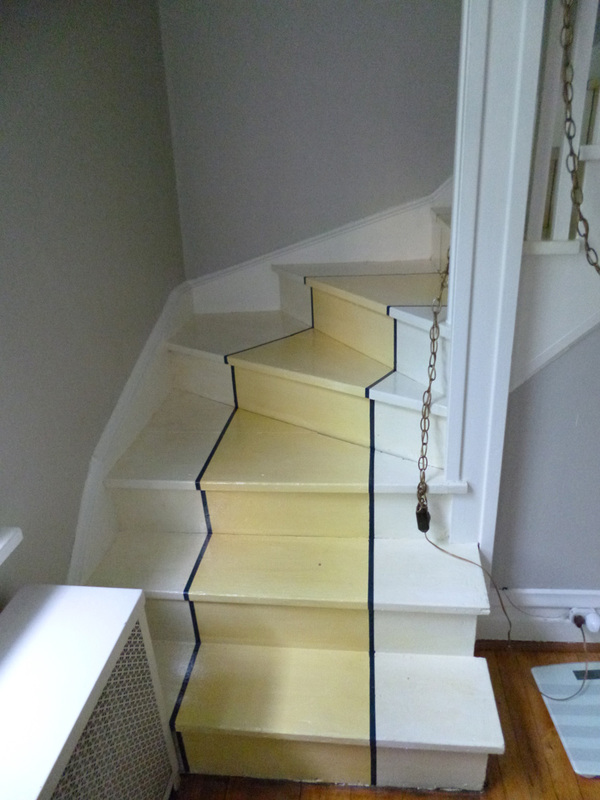 We had to do quite a few touch ups to the yellow and white before we put the poly on - and that was just a few days of us walking up and down the stairs. The paint got dirty and scuffed quite quickly. 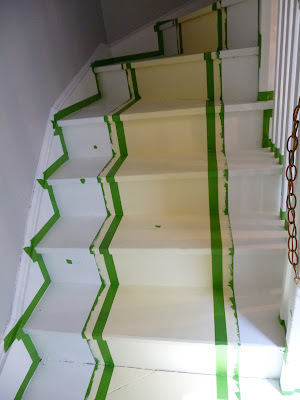 So if you take on stair painting project, don't skip this step, especially if you are using light colors. 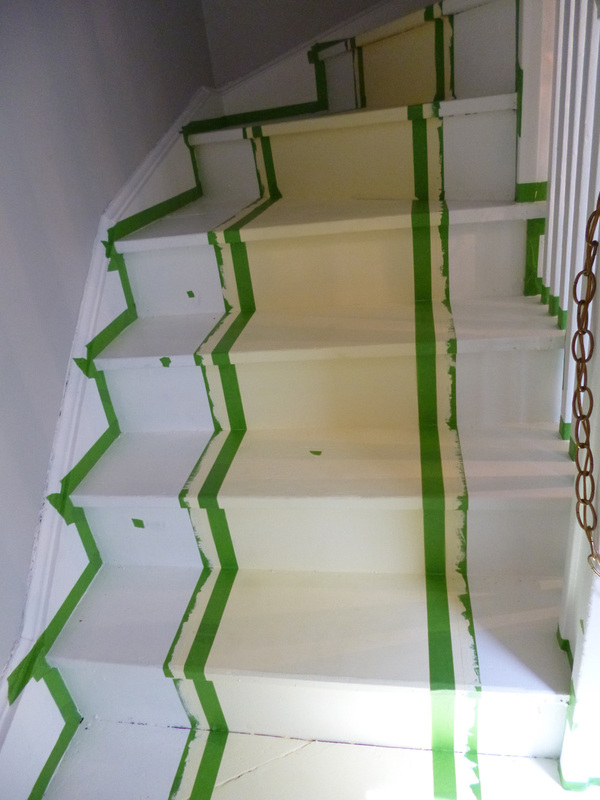 So are you ready for the tape free, polyurethaned staircase? Here it is. . .